Hibs’ fans were today given a huge boost when Head Coach Alan Stubbs and his coaching staff John Doolan and Andy “Taff” Holden agreed contract extensions that will see them at Easter Road until the end of the 2016/17 season. 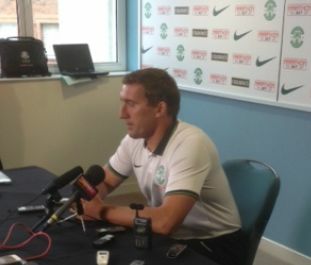 Stubbs said: “I am very happy to continue with the work in progress. I think supporters would agree that they have seen a lot of positive changes over the past year, and I know there is a lot more to come. “I think most supporters would agree that whatever disappointments they have suffered in recent seasons are behind us, we are on the right track now, we’re trying to play a winning and exciting brand of football that they want to see and be part of. “I believe in what we are all trying to achieve, and if there is one thing supporters can do to help me it is to get themselves along to Easter Road to support our team. To put it simply, we need you. “I’m grateful to all of those who have supported the team, especially all of those who have put up their hard-earned money – all of that has helped me get players in – but we need more supporters to come back to their Club if we are to continue to get stronger. “We made decent progress last year, this season we all know we need to get promoted. We need to be as strong as we can to achieve that, and while I know that the Board are giving me all the support they can, I also know that if we can get more people coming to games, I’ll be able to do more. Chief Executive Leeann Dempster was delighted to announce the news and said: “This is a tremendous demonstration of our ambition at this Club. We have a really talented management team, and their desire to stick with us shows that they understand we are determined to get this Club back to the top.